Jonah Lomu was the first reason I wanted to play rugby. Inspiration and true legend. Very sad news. Thoughts with his family. As far away as the valleys of Wales Jonah was inspiring players. 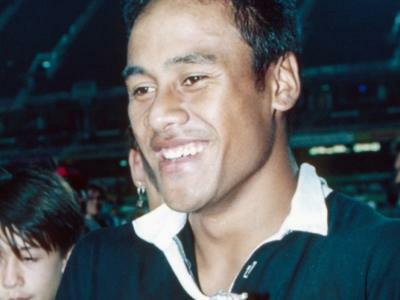 I first read about Jonah Lomu when France were touring New Zealand in 1994 during the series New Zealand capped a youngster who had been impressing everyone in the know, a kid, a big kid, going by the name Jonah Lomu. That tour made headlines not because of anything to do with Jonah but because France won a series against New Zealand in New Zealand. New Zealand do not like losing when it comes to their national rugby team and by the time the 1995 RWC arrived New Zealand had transformed into a very dangerous team but unknown to the rest of the world they were about to unleash the most sensational, explosive, powerful, athletic, fast rugby player the world had ever seen. 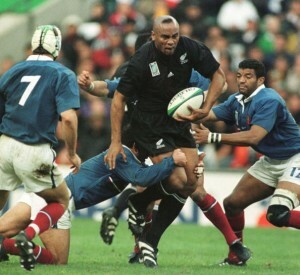 The 1995 RWC had so many reasons why it was such a special RWC but it was the launchpad for the career of Jonah Lomu. Lomu was such a sensation on the field but off of it he seemed shy and quietly spoken and was always humble. I like to think rugby is a holigans sport played by gentleman and Jonah epitomised this. Jonah played in a way that was going to test you physically no matter how big you were, he was aggressive and scary but off the field he was a gentle giant who smiled a lot. Two moments stick out in my memory about the superhuman ability of this man, the semi-final against England in the 1995 RWC where Jonah after beating two defenders finshed off by running over the top of Mike Catt and the semi-final against France in the 1999 RWC the French now well aware of how dangerous Jonah was had several players trying to bring him down and even with all that attention Jonah managed to score two tries. For all of us our time here is just temporary but it’s inspirational that one rugby player could have such an affect on so many players of so many different nationalities in his relatively short life. Jonah rest in peace. Tags: 1995 RWC, 1999RWC, Jonah Lomu, Mike Catt, Neemia Tialata, Philippe Bernat-Salles, Sam Warbuton | Permalink.